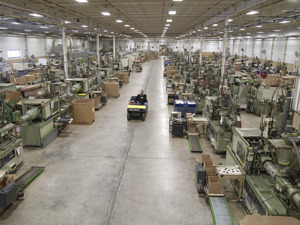 Planning for 2015: Benefits of manufacturing in the U.S. In the 1900s, the United States was booming. Companies set up shop on American soil and hired well-educated, motivated American workers to manufacture and sell their products. More recently, free trade and an ever-globalizing economy have encouraged American businesses to move their manufacturing facilities overseas, where they can employ less expensive labor with fewer regulations and ultimately sell their products to the end consumer at a lower price. At first glance, lower prices appear to be a good thing, a way of getting more products into the hands of more people more rapidly. However, a closer look reveals there are still many benefits of manufacturing in the U.S. vs. overseas. U.S. manufacturing facility. U.S. manufacturing creates jobs for Americans. Perhaps it sounds obvious, but there really is no way to understate the value of any company that keeps its roots in the United States and hires U.S. citizens for fair and honest work. And while overseas manufacturing may ultimately result in a lower-priced end product, who will purchase that product if no one has a job? U.S. manufacturing saves costs on deliveries. Overseas shipping can be exorbitantly expensive, while shipping within the United States is often quite reasonable, even for very large shipments. Overseas shipping also creates a greater room for error, misunderstanding, delays, and problems. Domestic shipments arrive more quickly. The sheer difference in the distance a product must travel to get from any destination in the United States versus the distance it must travel from Indian or China can make a difference of weeks at times. Faster shipping means faster delivery, which means faster sales. Sourcing goods locally is better for the environment. There is no question that in comparison to overseas shipments by plane or by boat, an inter-state UPS or Fed Ex shipment places a much lighter burden on natural resources. In addition, a bustling manufacturing industry within the United States keeps even more Americans working hard and earning money shipping, delivering, and receiving those goods. U.S. manufacturers are held to a higher standard of safety and quality control. Safety is perhaps one of the most important benefits of manufacturing in the U.S. v.s overseas. While it may seem a distant concern to some, the welfare of overseas workers is often placed in jeopardy. American regulations keep standards in place to ensure the safety of workers. Additionally, products themselves are often much safer when produced within the United States. Consider how many children's toys made overseas have seen product recalls when they have been found to be toxic or unsafe. U.S. manufacturers provide U.S. customer service. In this day and age of automated phone systems and overseas technical support, local, American service can be difficult to find but priceless to receive. There is no substitution within the world of customer service for speaking with a human being who is able to understand the situation and is knowledgeable and motivated enough to correct it. Overseas service, due to its separation from the manufacturer itself, is simply unable to provide the same level of personalized service. U.S. manufacturers pay U.S. taxes. In the United States, taxes subsidize everything from our roads to our water supply to our schools to our national defense. No one enjoys paying taxes, but we all enjoy the benefits of those taxes. Keeping American manufacturers in business in America can only benefit every citizen. Ultimately, the benefits of manufacturing in the U.S. v.s overseas far outweigh the lower costs that may result from overseas manufacturing. Supporting American manufacturers supports us all.